A Tale of Two Pictures. Guess who officially chose a writing journal and started working on her new novel last Thursday? Guess who is very, very excited about that? The idea for this one has been percolating for over a year now, and it’s been such fun to take it from something abstract to concrete. There’s still a lot of research and planning to be done before I begin writing, but I’m having so much fun with it that I don’t even mind. Don’t get me wrong, I’m just itching to write again after spending all those months editing, but I’ve always been a fan of this part of the process, too. There’s something invigorating about the plotting stage – the pages are still blank, literally and figuratively, just waiting for a world to be born, for characters to be born, for a story to be born. I’ve spent a lot of time these past several days fleshing out my two main characters and am almost giddy about their journeys. This book is going to be quite different from anything I’ve ever worked on, both format-wise and story-wise, and even though it feels strange to be visiting with other characters instead of Sofie and Company, it’s also exciting. I kind of feel like Pandora, but in a good way, about to open a new box and watch infinite possibilities spring up from inside. To Charlotte and Remi: I cannot wait to tell your stories. You are already like living, breathing people to me, and I’m looking forward to seeing where those possibilities take us. I’ve mentioned my love of General Hospital many times, so it should come as no surprise that yesterday’s event with Laura Wright, Lisa LoCicero, Julie Berman, and Kelly Sullivan was a blast. Pretty sure they had the entire place laughing out loud for two hours straight. It was lovely to talk with Laura again, and I’m especially glad for the opportunity to meet Lisa, whose sunny spirit is truly contagious. As always, the awesomeness of the cast made me even prouder to be a GH fan. So, so excited for this new adventure of yours. You will so Remi and Charlotte justice as you take them (and they take you!) on a beautiful journey. How exciting!!! Don’t you just like the symbolism of a blank page? And there’s something so much more intimate about it when you actually write with a pen, as opposed to typing on a computer. 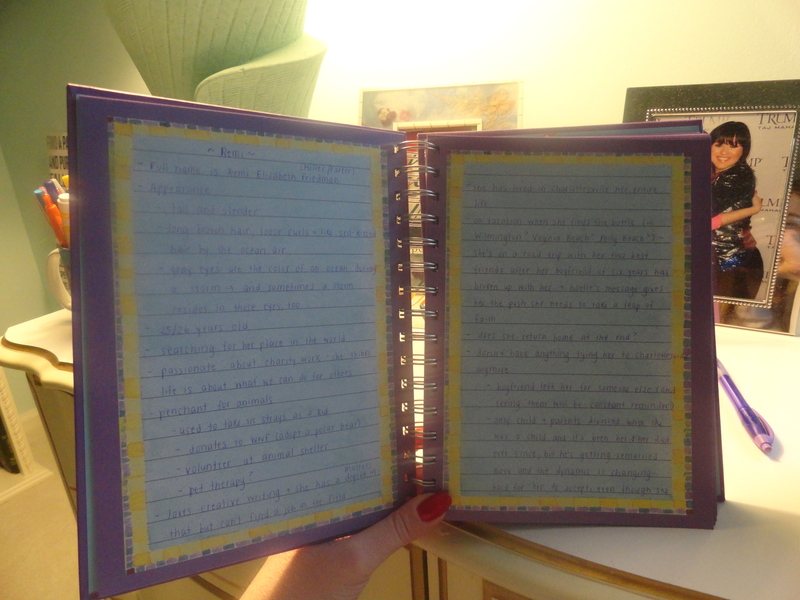 Good luck with your new novel :) You make me want to pull out my old journals again! Woohoo! I am SO excited about this new book! It sounds amazing, and your enthusiasm for writing and love of your characters is going to shine through this book just like I know it did your last ones. Good luck! By the way, I’m so jealous! I like the book that I’m working on, of course, and I’m having fun with these last few revisions, especially since things are really taking shape, but it’s such a rush to start something new. Enjoy! Thank you! After working on MTL for so long, it felt kinda strange to tackle something new at first … but once I really started getting to know this set of characters, it just became SO MUCH FUN. I’m unbelievably excited about this idea and having the best time researching everything. Can’t wait to begin writing!